This Thursday, the Hexagram-Concordia Centre for Research-Creation in Media Arts and Technology continues its Distinguished Speaker Series in collaboration with Conversations in Contemporary Art with a lecture by Tolaas. With experience in multiple fields, including chemistry, linguistics and visual art, Tolaas’s work lies somewhere between researcher, artist and consultant. In addition to working on her own olfactory artistic projects, she has worked with companies such as Comme des Garçons and Chanel, and her research lab in Berlin is sponsored by International Flavors & Fragrances, the world’s largest producer of fragrances. “She works with industry, she works in the art world, and then she does these interdisciplinary research projects,” said Chris Salter, director of Hexagram-Concordia and coordinator of the upcoming event. Beginning with a lecture from Tolaas, the event will transition into a “Hexa_Out” session—a roundtable discussion between Tolaas and other artists and researchers whose work deals with the senses and animal perception. The panel will be moderated by David Howes, a Concordia professor of anthropology and director of the Concordia Sensoria Research Team, whose work deals with the senses in relation to culture. Salter described why it is difficult to discuss scent in an artistic or academic setting. “Smell is very interesting because we don’t have a strong language for it. We have all sorts of words for vision, but we don’t have a lot of words for smell,” he said. Scent, said Salter, is considered a lower sense in western society, along with touch and taste. Sight has been the predominant sense in the art world for a very long time, with manifestations like painting and sculpture, which are passive artworks. Scent, on the other hand, is active—it enters your body and you experience it as a part of the work, rather than stepping back and simply observing. Tolaas believes there is a lack of education surrounding the senses, especially smell. Tolaas explained that by not teaching people to understand their sense of smell we are losing a part of our personal and cultural identity. “We all have a smell ID as unique as our fingerprint, but when do we find it out?” she asked. She also decried the sterilization, deodourization and perfuming of the world—that by removing or covering up natural scents we also remove important information from the world. “I’m not [saying], ‘We need dirty humans, we need dirty cities.’ That’s not what I’m saying. But there’s no need to camouflage everything,” she said. The first step towards training the underused sense is overcoming scent prejudices. For Tolaas, scent is a medium like any other. 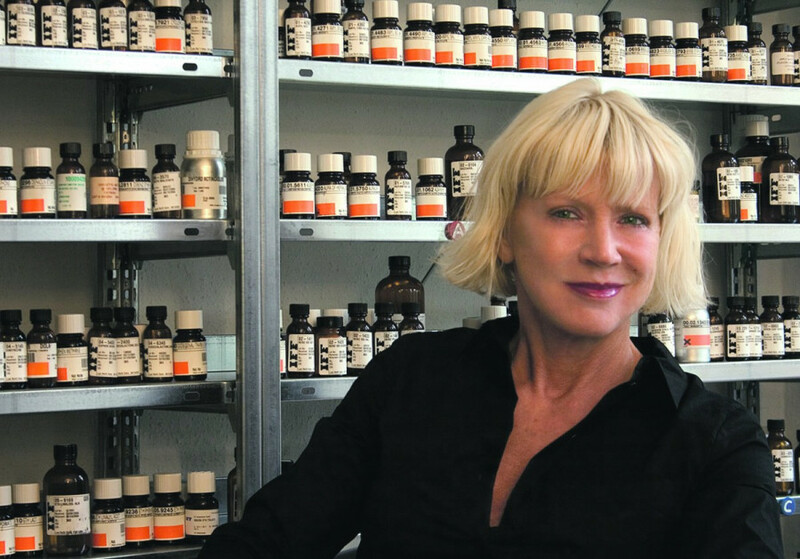 Her research lab houses countless scents, from Moroccan rose to stinky socks, and synthetics, extracts and physical samples harvested from around the world. “I try to relate to smell intellectually or rationally rather than emotionally,” she said. Human Cheese, an ongoing project of Tolaas’s in collaboration with biologist and artist Christina Agapakis, explores the notion of good and bad smells. In the latest installation of the project, a lab was set up where participants could donate various bacteria from their bodies that were then used to ferment actual cheese. If cheese has a strong odour it’s considered a positive thing, Tolaas explained, but the same isn’t true when it comes to the body. The project aims to showcase the importance of our bodies’ bacteria in a tangible way. “It’s more food for thought than food for eating,” she said.